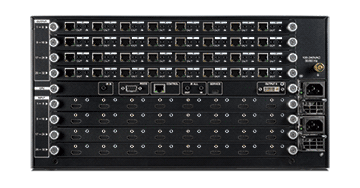 The CYP Modular matrix series offers new levels of flexibility and performance to installers looking to effectively distribute and manage AV signals throughout any multi-room AV environment. Our modular solution is available with a 16x16 and 32x32 chassis. These chassis utilise input and output modules, each with 8 input or output connections accordingly. It is also possible to use blanking modules on either chassis effectively creating any modular configuration with multiples of 8 inputs and outputs, up to a full 32x32 matrix. Select input and output modules with HDBaseT™, HDBaseT™ LITE, HDMI, DVI and VGA technologies for easy in-built signal conversion from any input to any output module. Installers can customise the required input and output modules that are specifically required for their installation. 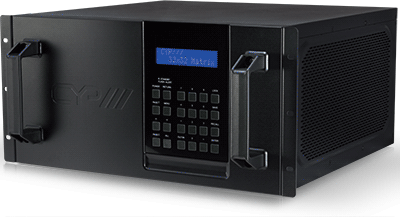 All CYP Modular Matrices are built-to-order, tested, certified and shipped pre-configured, so when your matrix arrives on site, it is ready to go, straight out of the box. With a team of technicians on hand to customise your modular matrix, we aim to configure any matrix within 24 hours of confirmed order and can often ship same day for next day delivery. Try using our online modular matrix configuration tool to find out more about the available options and guide you through the configuration process to providing you with a product specification and bill of materials to help the ordering process. Customise your matrix with modular Input & Output boards to suit the installation environment. High Definition Audio supported: Dolby TrueHD, Dolby Digital Plus and DTS-HD Master Audio plus LPCM (excluding DVI). Common supported resolutions: 480i to 1080p, and VGA to WUXGA, plus 4K UHD. Installer friendly EDID management settings for optimising system configurations. Supports RS-232, Telnet, and IP Controls. Supports additional IR Control via a master (ALL) Input/Output.